(Editor's note: I can't recall a Famous Speech Friday post more discussed before publication than this week's post. Both writer Becky Ham and I have long and solid reputations in science communications, and our debate focused on whether, in presenting a speaker whose scientific accuracy has been in question, we would be presenting a less-than-stellar role model for women speakers. As a former senior official at the U.S. Environmental Protection Agency, I don't want to present bad information as something you should emulate. The journalists who have pointed out this speaker's shortcomings are reputable, and I trust their perspectives. At the same time, there's no denying that this is a charismatic and famous woman speaker, whose issue is an important one, and whose appearances draw large crowds and attention. Those speeches command a current speaking fee of $40,000. 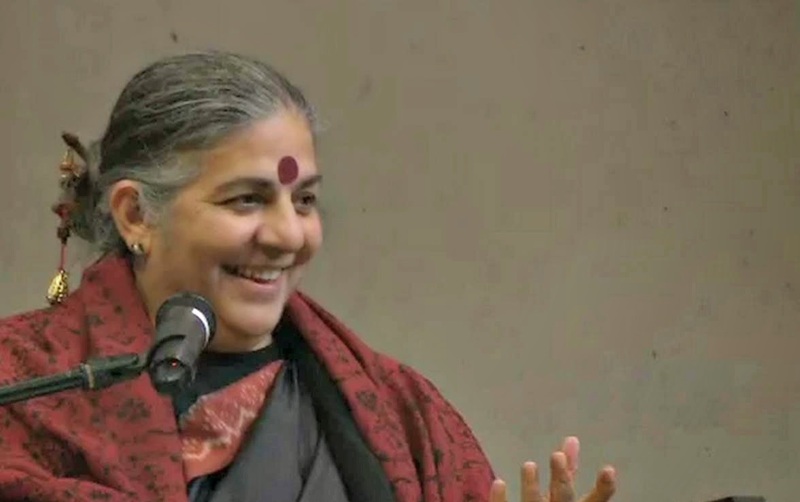 In the spring of 2014, environmental activist Vandana Shiva traveled through southern Europe as part of a "seed caravan" to promote local agriculture and oppose the use of genetically modified organisms. But the real ride came later, when the New Yorker published a profile of Shiva that questioned the scientific accuracy of her views and highlighted some of her incendiary rhetoric and absolutist stances on GMOs. Shiva responded at length to what she felt were "fraudulent assertions and deliberate attempts to skew reality" in the profile by Michael Specter, and you can read New Yorker editor David Remnick's reply to her criticism. Even before this latest controversy, however, it would have been safe to call Shiva a polarizing figure. Her opposition to the use of biotechnology in farming, conducted through her India-based organization Navdanya, has made her a hero to anti-globalization forces which distrust Big Agriculture companies such as Monsanto, for instance. But as the New Yorker profile pointed out, several scientists have noted that her opposition to the crop science is based on flawed or misinterpreted research. Shiva has received a slew of environmental awards, including The Right Livelihood Award, often called Sweden's "alternative Nobel Prize." But she has also been singled out as a dangerous demagogue who continues to promote data even after they have been thoroughly debunked, including one claim that linked Indian farmer suicides to GMO cotton crops. An attention-grabbing start. It's a speech about food and farms, but Shiva sets her tone right away by talking about war. The very premise of modern agriculture, she suggests, is built on poisons and explosives foisted off on the public in peacetime. You might think it's a stretch, yes, and it gets even stretchier further into the speech. But it's dramatic and gives her listeners an immediate glimpse at her stance on the topic. Lots of vocal variety. Shiva is the master of the pause, and uses it throughout the talk as her vocal highlighter. When she wants a statistic or an anecdote to sink in for her listeners, she wisely gives it some space with a bit of silence. She also uses several vocal styles in this speech, including a slightly higher pitched incredulous voice, a hushed and less inflected voice in sorrowful moments, and even a conspiratorial, behind-the-hand tone when she's ridiculing something like potential Martian farming. The speech clocks in at nearly an hour, and this vocal variety helps to keep things lively. Totalitarianism on our farmers, where farmers cannot grow what they want and the way they want it. They are locked into a seed slavery...When starting to fight for seed freedom, it's because I saw a parallel. That time, it was blacks who were captured in Africa and taken to work on the cotton and sugarcane fields of America. Today it is all of life being enslaved. All of life. All species. A word of caution to speakers who aren't planning a career of provocation, however: It's fine to strive for vivid metaphors in a speech, but take care that your comparisons serve the overall mission of your talk. In this case, the comparison feels so strained and offensive to me that it makes me suspicious of everything she's discussed to this point. You can watch the full video of the speech below, and read the transcript here.